Wordle lets you create “word clouds” from an RSS feed, a del.ici.ous username, or you can paste in a bunch of text to generate you word cloud. Once you have the text all set, you can tweak your word cloud with different layouts, fonts, and color schemes. And because images created by the Wordle application are licensed under a Creative Commons Attribution license, you can use your Wordle on anything from book covers to T-shirts. I added my Wordle to my new Contact page. Just remember to let people know how you created your Wordle. 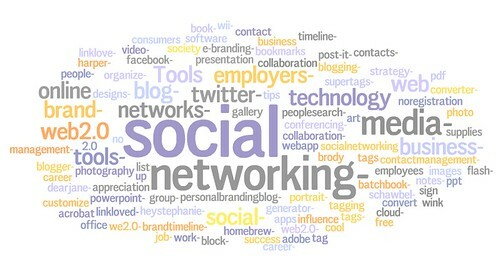 If you took an image from the Wordle gallery, don’t forget to mention where you got it from. Thanks to Andrew, author of The Working Title, for highlighting Wordle in his blog. Otherwise, I wouldn’t have found out about this awesome site. And kudos to Jonathan Feinberg for creating Wordle, I absolutely love it. I had trouble using the embed code from Wordle.net on WordPress. What I did instead was take a screenshot and save it as a jpg then added it to my post. That should work out. Let me know if you have any questions.